During the walk, students took turns carrying jugs of water to recognize the difficulty many have in getting water to their homes. 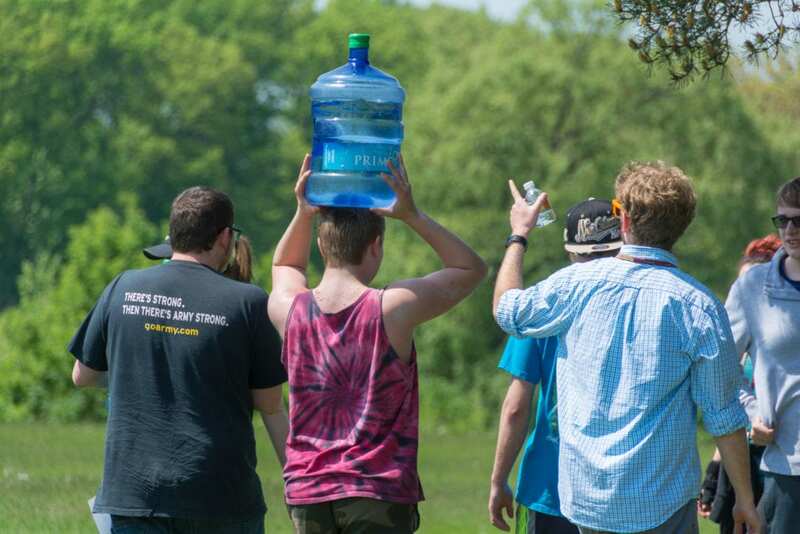 On Friday, May 25, students at Sackett Educational Center participated in the “Walk for Water” fundraiser for the second year. Students read the book “A Long Walk to Water,” which tells the true story of Salva Dut, a part of the Dinka tribe and a Sudanese Lost Boy, and the fictional story of Nya, a young village girl that was a part of the Nuer tribe. The book, written by Linda Sue Park, was used as a platform to support Dut’s program, Water for South Sudan, which began in Rochester. Social Studies teacher Joal Bova says he tries to get his students thinking globally and is always looking for ways to get his students involved in projects with a global reach. This goal was also the push behind Sackett’s Kiva project last year. The 2018 Walk for Water raised nearly $700 for Water for South Sudan. During the walk, which took place on the Sackett grounds, students had a table with Park’s book, as well as information about the Hoosick Falls PFOA contaminations, and a letter to New York Governor Andrew Cuomo that walkers could sign, urging him to enact legislation to remedy the issue. As of the end of the day on Friday, students raised $687 for Water for South Sudan. With a few donations still outstanding, Bova expects the total to exceed $700, exceeding last year’s total by more than $100. Steve’s Well Pump Repair in East Greenbush and Smith Well Drilling Inc. in Niverville contributed to help sponsor this year’s walk.